Note: A full press kit for the museum groundbreaking is now available. The Smithsonian broke ground for its 19th museum, the National Museum of African American History and Culture, Wednesday, Feb. 22, at 10 a.m. in an invitation-only ceremony on the National Mall. President Barack Obama spoke at the ceremony. Other honored guests included First Lady Michelle Obama, former First Lady Laura Bush, Rep. John Lewis (D-Ga.) and Gov. Sam Brownback (R-Kan.). The ceremony took place on the museum’s five-acre site adjacent to the Washington Monument at 14th Street and Constitution Avenue N.W. Full version of the architectural fly-through video is available on YouTube. The National Museum of African American History and Culture was created in 2003 by an Act of Congress, establishing it as part of the Smithsonian Institution. The museum will be the nation’s largest and most comprehensive cultural destination devoted exclusively to showcasing African American life, art, history and culture. 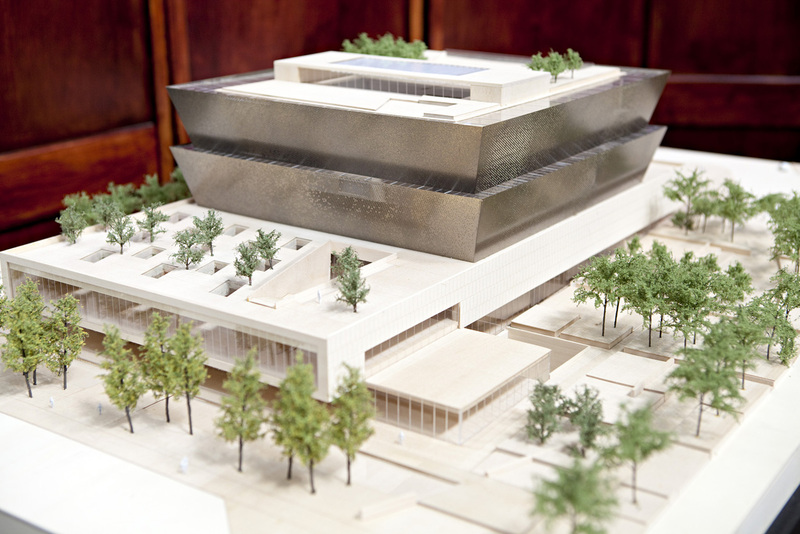 The construction of the museum will begin in summer 2012 and is expected to take three years. FreelonAdjayeBond/SmithGroup was selected as the museum’s architectural and engineering firm in April 2009, and Clark/Smoot/Russell was selected as the construction firm in July 2011. The museum is expected to cost about $500 million, with half of the funds being raised by the museum and half of the funds provided by Congress. The museum currently has about 25,000 objects in its collection, which cover the major periods in African American history, beginning with the origins in Africa and continuing through slavery, Reconstruction, the civil rights era, the Harlem Renaissance and into the 21st century. Some highlights of the collection are the Harriet Tubman collection, including her hymnal, lace shawl (given to her by Queen Victoria) and family photographs from her funeral; a Jim Crow railroad car (c. 1922); the Black Fashion Museum collection; a Tuskegee Airmen Boeing-Stearman PT-13D trainer plane and Congressional Gold Medal; and works of art by Charles Alston, John Biggers, Elizabeth Catlett, Jacob Lawrence and Lorna Simpson. Slavery and Freedom will focus on the crucial role slavery played in the making of America and its impact on generations of enslaved Africans and their descendants. It will consider the paradox of a nation founded on the principles of life, liberty, justice and equality at a time when one-fifth of the population was enslaved. Defending Freedom, Defining Freedom: The Era of Segregation will explore the years following Reconstruction, the restrictive laws and practices that created a segregated society, and the violence and intimidation that kept the races separate. It also will explore the great migration of African Americans from the South, cultural movements such as the Harlem Renaissance and the modern civil rights movement. Beyond 1968 will explore the social and political history of an era beginning with the death of Martin Luther King Jr. and ending in 2009. It also will examine how the quest for racial equality helped shape the development of popular culture, education, entertainment, politics and social policy. Power of Place will show the broad diversity of African American life and regional cultures in communities that took root in different areas of the country. Visitors will recognize pieces of their own history and regional cultures in the exhibition and make connections to gain insight into the variety of places that exist across America. Making a Way Out of No Way will examine how African Americans acted to change and build their lives in the midst of racial oppression. It will showcase the stories of individuals whose lives exemplified this struggle as well as the organizations and institutions that provided strength and support for the black community. Military History will look at the service and sacrifice of black soldiers, Airmen, Marines, Coast Guardsmen and sailors, as well as the roles that African American women and families played back home. Sports: Leveling the Playing Field will showcase the inspiring ideas, efforts and skills that African Americans have put into this vital part of American life. It also will explore how sports helped people respond to injustice and form communities. Musical Crossroads will tell the story of African American music from the arrival of the first Africans to the present day. Additional exhibitions will focus on cultural expressions, entertainment, visual arts and youth. The exhibitions are being designed by Ralph Appelbaum Associates in collaboration with the museum’s curators and historians. RAA has designed exhibitions for numerous museums, including the United States Holocaust Memorial Museum, the William J. Clinton Presidential Library and the Newseum. Currently, the museum has its own gallery at the National Museum of American History. The museum’s current exhibition “Slavery at Jefferson’s Monticello: Paradox of Liberty,” opened to the public Jan. 27 and will be on view until Oct 14. This exhibition, presented in partnership with the Thomas Jefferson Foundation at Monticello, features artifacts from the Smithsonian’s collections and from excavations at Jefferson’s Virginia plantation. It provides a rare and detailed look at the lives of six slave families living at Monticello. 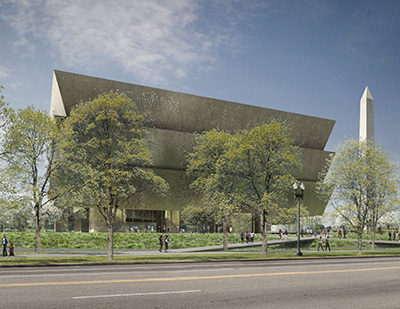 Freelon Adjaye Bond/SmithGroup was selected as the architectural team chosen to design the National Museum of African American History and Culture to be located on the National Mall near the Washington Monument. The Monument site was selected as the location for the National Museum of African American History and Culture on Jan. 30, 2006. 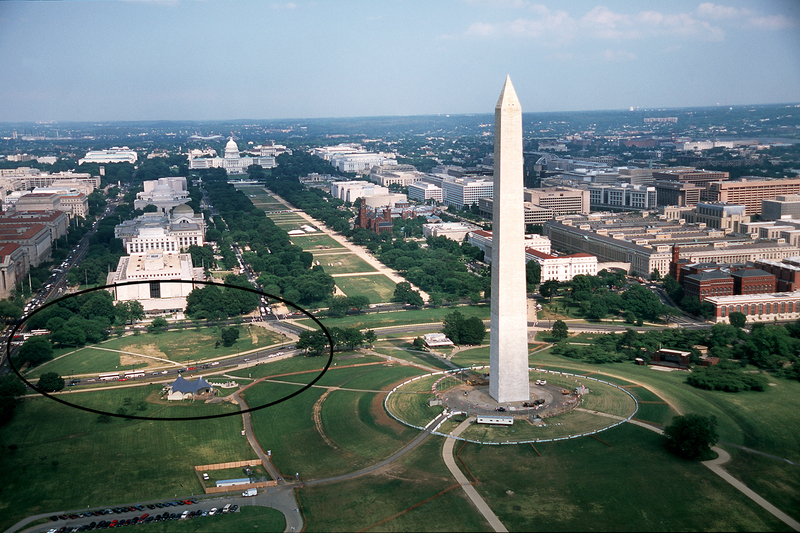 Shown circled on the photo, the Monument site is bordered by Constitution Ave. on the north, Madison Dr. on the south, 14th St., N.W. on the east and 15th St., N.W.